Today India is home to a large number of international brands that have entered the market using the franchising model. Many of these are food and beverage (F&B), apparel and luxury brands. Prominent examples include Burger King, Pizza Express, Dunkin' Donuts, Hard Rock Cafe, Hermès, Fendi, Burberry, Bottega Veneta, Paul Smith, Jimmy Choo and Roberto Cavalli. In 2018, Bath & Body Works opened stores in India, in partnership with Major Brands. Various market entry options are available to foreign brands. The available options include operating the Indian business through an Indian subsidiary wholly owned by the foreign brand; entering into a joint venture, franchise arrangement or licensing arrangement with an Indian partner; or a combination of these structures. Considering the size and diversity of India, and to cater to local tastes, franchisor's often localise their offering to appeal to the Indian consumer; for example, McDonald's and Starbucks have both introduced food options that cater to Indian tastes. Foreign investment is permitted in most sectors of the Indian economy, except for atomic energy, lottery, gambling, etc. where foreign direct investment (FDI) is not permitted. The few limitations that may affect a prospective franchise arrangement are as follows. Foreign companies can own up to 100 per cent equity interest in an Indian company offering single-brand retail services. For this purpose single-brand retail refers to retail trading of products that are sold under a 'single brand' – that being the brand name under which the products are sold internationally. Products should be branded as such during manufacturing. International brands such as Zara, IKEA, Mothercare, Clarks and Marks & Spencer have entered India using this route. Although 100 per cent FDI is permitted in single-brand retail, prior government approval is required for foreign investment in excess of 49 per cent. If foreign investment in the Indian company exceeds 51 per cent, then 30 per cent of the value of goods purchased by the Indian company must be sourced from India, preferably from micro, small or medium-sized enterprises, village and cottage industries, artisans and craftspeople. These sourcing norms do not apply up to three years from the opening of the first store by single-brand retail entities having state-of-the-art and cutting-edge technology, and where local sourcing is not possible. An application seeking permission to invest more than 49 per cent in a single-brand retail company must specifically indicate the product or product categories to be sold under the single brand and any change in product or product categories to be sold requires prior approval of the government. In cases of foreign investment up to 49 per cent in a single-brand company, the list of product or product categories to be sold, except food products, must be provided to the Reserve Bank of India (RBI). Entities permitted to undertake single-brand retail trading through brick-and-mortar stores are also permitted to undertake e-commerce activities. Foreign companies can own up to 51 per cent equity interest in an Indian company offering multi-brand retail services, with prior government approval. An Indian company operating multi-brand stores, and that has foreign investment, can set up stores in states that have permitted multi-brand retailers to operate. In the permitted states, stores may be set up in cities above a specified population. Additionally, sourcing conditions similar to those set out above for single-brand retail apply to multi-brand retail: multi-brand retailers are required to invest a minimum amount of US$100 million and certain requirements for investment in back-end infrastructure must be satisfied. UK-based Tesco Plc was the first to apply and obtain DIPP approval for multi-brand retail trading in India, but stores have not been opened. The Modi government, which took office in 2014, has not changed the FDI policy in this respect, but equally this sector has not seen any foreign investment since the Modi government took office. 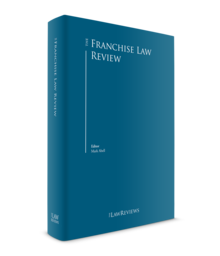 Indian exchange control laws8 are relevant to several aspects of franchise arrangements, particularly with regard to payments between Indian franchisees and international franchisors. Indian franchisees can make royalty payments and remit fees for technical services to international franchisors without any limit and without approval of the RBI. Certain other trade payments may also be made without approvals. If the payment sought to be made to an international franchisor does not fall within the permissible categories, the Indian franchisee will require specific approval from the RBI to make the payment. The approval process can be time-consuming and it is uncertain whether the RBI would grant approval. Therefore, it is advisable to seek legal advice on the type of payments proposed to be made under the franchise arrangement to ensure that the payments are correctly structured to be freely permissible under the Foreign Exchange Management Act 1999 (FEMA). Following India becoming a signatory to the WTO TRIPS Agreement, with effect from 1 January 1995,9 Indian intellectual property (IP) laws were amended to make them more consistent with globally accepted IP norms and practices. These amendments coupled with better enforcement of the law have significantly improved the IP protection regime. To protect their trademarks and brands, franchisors will normally also register their trademarks in India. They enter into contractual arrangements with the franchisee, such as trademark licence agreements or by including detailed provisions in the franchise agreement. The process of searching for protected trademarks and other IP relevant to franchises (such as image rights) is quite simple. This can be done using the public search engine for trademarks on the Ministry of Commerce and Industry website.10 For a franchisor considering India as a franchising destination, this search engine can be helpful as it enables a potential franchisor to identify commonly known marks and prohibited marks, while also showing business images that are currently trademarked in India. To register a trademark, the proprietor of the mark must make an application in the prescribed form.11 Applications for registration of trademarks are examined by the Registrar of Trade Marks. If the Registrar decides to accept the application, the application is published in the official gazette, the Trade Marks Journal. Following publication in the gazette, any person can, within a specified period, file an opposition. Where oppositions are filed they must be dealt with according to the procedure prescribed and the decisions of the Registrar may be appealed before the Intellectual Property Appellate Board. If no opposition is filed within three months, the trademark proceeds to registration. Registered trademarks are protected in perpetuity subject to renewal of the registration after every 10 years. If a trademark is infringed, civil remedies can be pursued under the law of passing off or under the Trade Marks Act 1999 (the Trademarks Act) depending on whether the trademark in question is registered, pending registration or unregistered. Further, in respect of registered trademarks, criminal remedies set out by the Trademarks Act may also be available. Typically, in cases of trademark infringement, provided the court is satisfied, interim injunctions may be obtained to stop the infringing conduct until the infringement suit is decided. Such injunctions are normally granted at an early stage of the trial. Know-how belonging to a franchisor may also be protected under the Indian Copyright Act 1957 or the Patents Act 1970 if it is capable of protection under those laws. If statutory protection is not available, contractual remedies will still be available to the franchisor and it is usual to see detailed provisions in the franchise agreement dealing with protection of know-how. Customer data is important for companies looking to market or cross-sell their products. India's data protection provisions are not located in one cohesive piece of legislation. This can therefore be an area that needs careful consideration by lawyers reviewing the types of personal data that may be collected by the franchisee or the franchisor and the impact that legislation such as the Information Technology Act 2000 (the IT Act) and the Information Technology (Reasonable security practices and procedures and sensitive personal data or information) Rules 2011 (the DP Rules) may have on the manner in which personal data is collected, handled, stored and processed. On a strict reading of the DP Rules, difficulties can arise in determining whether the DP Rules apply to personal data that is not sensitive personal data and to companies that are not based in India. The pragmatic view is that consent should be obtained to collect, process, store, handle and export personal data. In addition to the DP Rules, Indian law, including through recent judgements of the Supreme Court of India,16 generally recognises the right to privacy of an individual and a person who discloses personal data in violation of their contractual obligations commits an offence under the IT Act. So far as sensitive personal data is concerned (which includes bank and credit card information), the DP Rules would generally apply. Under the DP Rules, sensitive personal data must not be exported to a country that does not afford the same level of data protection as offered by the DP Rules, although export is permitted if the transfer is necessary for performance of a contract or if consent for the transfer has been obtained from the data controller or the data subject. The IT Act also deals with cybercrime such as hacking, identity theft, tampering with computer records, and prescribes penalties and offences in respect of those matters. Currently, India is looking to enact comprehensive data protection legislation, a draft of which was tabled for public comments in 2018. Unlike many jurisdictions, India does not have a specific statute dealing with franchise matters. The closest point for interpretation was available in India's Finance Act, which has now been repealed, owing to the introduction of the Goods and Services Tax. The Finance Act had defined franchise, in the context of service tax, to mean an agreement by which the franchisee is granted the representational right to sell or manufacture goods or to provide service or undertake any process identified with a franchisor, with respect to any trademark, service mark, trade name, logo, etc. A franchisor was defined as any person who enters into a franchise with a franchisee and the term 'franchisee' is construed accordingly.17 These definitions are not mentioned in the law relating to the Goods and Services Tax. However, the Indian Contract Act 1872 (the Contract Act), the Sale of Goods Act 1930 and the Specific Relief Act 1963, which apply to all commercial arrangements, are relevant to franchise agreements (these are discussed in detail below). In contrast to the requirements in the United States, there are no laws requiring a franchisor to provide a lengthy franchise disclosure document to potential franchisees within a stipulated period prior to signing the franchise agreement. Aspects of potential litigation, bankruptcy, initial fee, estimated initial investment, etc. are expected to be captured by a party's own due diligence and commercial understanding. Franchise agreements are not required to be registered in India. Indian law does not regulate termination of franchise agreements. Parties are therefore free to incorporate provisions in the franchise agreement dealing with termination. Franchise agreements will usually permit termination for breach of contract and insolvency, and stipulate the consequences of termination. If the franchise agreement is terminated, an international franchisor's ability to take over the franchisee's business is predicated on applicable foreign investment guidelines. If the Indian company operating the business is a joint venture between the international franchisor and the Indian franchisee, in the single-brand retail sector, the franchisor could acquire the franchisee's interest in the joint venture such that the Indian company becomes a wholly owned subsidiary of the international franchisor. However, if the Indian company operates in the multi-brand retail sector, and assuming the current foreign investment guidelines continue to apply, the international franchisor could not acquire all the franchisee's interest in the joint venture and would have to find a local Indian partner to own 49 per cent interest in the Indian company. Alternatively, if the international franchisor wishes to exit the joint venture, it could sell its stake in the joint venture, to the franchisee. In a purely contractual relationship where the franchisor does not own an equity interest in the franchisee or the Indian company operating the business, the franchise agreement should specify the consequences of termination, including any step-in rights for the franchisor. Step-in rights must be drafted keeping the FEMA in mind. For example, under the FEMA, foreign companies cannot directly enter into a lease for property in India, except in limited circumstances (as discussed in Section II). Therefore, an international franchisor desirous of stepping into the franchisee's position will need to establish an entity in India to whom the lease may be assigned. Inter alia, the Sale of Goods Act 1930 stipulates conditions that are implied into contracts for sale of goods (some of which can be contractually waived), rules relating to passing of title and risk in the goods, and the remedies for breach of such contracts. The Specific Relief Act 1963 set outs the remedies available for enforcement of contracts. Until recently, specific performance of a contract was a discretionary remedy that was awarded if the court was satisfied that damages would not be adequate for breach of a contract. However, pursuant to the amendments made by the Specific Relief Amendment Act 2018, courts are now bound to award specific performance except in certain cases.22 Additionally, under the substituted performance regime introduced by the Specific Relief Amendment Act 2018,23 the aggrieved party can engage a third party or an agent to perform the contract and recover expenses and costs actually incurred by it in seeking this substituted performance from the defaulting party. Further, if the substituted performance remedy is exercised, the aggrieved party cannot seek specific performance but can seek damages for breach of contract. Franchise agreements may require a franchisee to deliver a parent company guarantee or a bank guarantee, guaranteeing performance of the franchisee's contractual or payment obligations under the franchise agreement. Guarantees are contractual in nature and are regulated by the Contract Act. Under the FEMA, an Indian company or individual cannot issue a guarantee in favour of a company or individual resident outside India, except in limited circumstances, without prior permission of the RBI and there is no certainty as to whether the permission would be granted by the RBI. Normally payments under franchise agreements attract direct and indirect taxes in India. Income tax will be payable by a franchisee on the income earned from franchise operations. If the franchisee is providing a service to consumers (for example, a restaurant), Goods and Services Tax will be payable by the entity providing the services. A franchisor may be liable to pay income tax in India if it is resident in India for tax purposes. If the franchisor is based outside India, the franchise agreement should be structured carefully to ensure that the franchisor is not considered to have a permanent establishment in India. The fee payable for the use or enjoyment of intellectual property is a taxable service under the Goods and Services Tax regime in India and attracts tax at the rate of 12 per cent. If the franchisor is based outside India, the franchisee will be legally obliged to pay Goods and Services Tax to the Indian tax authorities. Furthermore, depending on the terms of the franchise agreement, additional taxes such as customs duty may be levied on goods imported by the franchisee from the franchisor. International franchisors often route their investment or contractual arrangements in India through entities based in tax-efficient jurisdictions. Except in the context of fiduciary relationships, Indian law does not imply an overarching duty of good faith in contractual arrangements. Parties may, however, contractually agree a duty to act in good faith. Having said that, in the event of a dispute, even in the absence of any contractual understanding regarding good faith, courts will consider conduct of the parties in granting relief and the equitable principle that a party cannot take advantage of its wrongdoing may be considered by the court in granting relief. The Contract Act deals with contracts of agency. An agency arises if a person is employed to undertake acts for another person or to represent that person. Franchise agreements will normally be drafted to clarify that the parties do not intend to create a principal–agent relationship. If an agency relationship is taken to exist, the provisions of the Contract Act that deal with such relationships would apply, including the principal being liable for acts of the agent in certain circumstances, such as tortious acts. There could also be tax consequences for the franchisor if the agent is considered to constitute a permanent establishment of the franchisor in India. In instances of sub-franchising, the sharing of liability between parties would be governed by the contractual agreements between them. It is unlikely that the franchisee would be treated as an employee of the franchisor under Indian employment laws, as often the franchisee would be a corporate entity rather than an individual. It would be advisable to incorporate clear drafting in the franchising agreement demarcating responsibilities with respect to franchisee employees, and their salary and benefits. There is a plethora of employment laws in India, which cover aspects such as wages, payment of benefits, gratuity and leave. Companies formed in India are bound by these laws, and additional regulations depending on individual states may also apply. The Consumer Protection Act 1986 deals with the rights of consumers. While consumers can seek relief under this legislation for deficiency in goods or services supplied to them, by definition an entity that purchases goods, hires or avails itself of services for resale or commercial purposes is excluded from the definition of a consumer. Accordingly, a franchisee may not be able to pursue actions against a franchisor under this legislation, unless a more expansive view of the definition of a consumer is adopted by the courts. The Competition Act 2002 deals with anticompetitive agreements and arrangements that constitute an abuse of a dominant position. Broadly speaking, anticompetitive agreements, such as exclusive distribution agreements are void if they cause or are likely to cause an appreciable adverse effect on competition within India, although there are exceptions that entitle a person to restrain infringement of or impose reasonable conditions to protect rights conferred on it under the Trademarks Act and other specified statutes protecting IP. If the Competition Commission determines that a party is abusing its dominant position, based on the criteria specified in the Competition Act 2002, civil penalties may be levied. The Contract Act generally provides that except in limited circumstances contracts in restraint of trade that operate after termination of the contract are void. Having said that, it is not unusual for franchise agreements to contain post-termination non-compete arrangements, while recognising that there may be limits on their enforceability. Non-solicitation obligations restricting a party from poaching employees of another party that apply during or after the term of a contract are generally enforceable. Several statutes in India deal with fraud, anti-corruption and money laundering matters. In general, the Prevention of Corruption Act 1988 penalises corruption by public officials and both the public official as well as the giver of a bribe are potential offenders. Further, the Prevention of Corruption Act 1988 was amended in 2018 to specifically include an offence of bribing public officials by persons associated with commercial organisations. It is important to note that there are no exceptions for speed money or facilitation payments under the Prevention of Corruption Act 1988. The Prevention of Money Laundering Act 2002 seeks to prevent money laundering, including laundering of property derived from corruption. In addition to Indian laws, the US Foreign Corrupt Practices Act 1977 and the UK Bribery Act 2010 may also be relevant to the Indian operations, given their wide scope of operation. Recently, anti-corruption allegations seem to have been more robustly investigated and some convictions of high-profile people have occurred. A more transparent environment and rigorous enforcement of corporate governance and anti-corruption legislation is a positive development. The Arbitration and Conciliation Act 1996 (the Arbitration Act) is the Indian legislation relating to arbitration. The Arbitration Act is divided into several parts. Part I of the Arbitration Act deals with various stages of arbitration proceedings such as initiation and conduct of arbitration and enforcement, and challenge of arbitral awards. Part II of the Arbitration Act deals with enforcement of foreign arbitral awards (being awards delivered in foreign-seated arbitration proceedings) pursuant to either the New York Convention on Recognition and Enforcement of Foreign Arbitral Awards 1958 (the New York Convention) or the Geneva Convention on the Execution of Foreign Arbitral Awards 1927 (the Geneva Convention). In recent years, Indian courts have adopted a pro-arbitration stance and the Arbitration Act was amended by the Arbitration and Conciliation (Amendment) Act 2015 (the Amendment Act)28 to bring the Arbitration Act in line with global standards and to address certain ambiguities in the law. Further amendments to the Arbitration Act have been proposed and these are pending approval by the Indian Parliament. Pursuant to the Commercial Courts, Commercial Division and Commercial Appellate Division of High Courts Act 2015,29 separate commercial courts at the district level and a commercial division of High Courts at the appellate level have been established to decide on commercial disputes of a specified value (currently 10 million rupees), including applications or appeals arising out of domestic or international commercial arbitrations. Importantly, the definition of commercial disputes includes disputes arising out of franchising agreements, distribution and licensing agreements. While the enactment of these laws is encouraging, given the backlogs in the Indian court system and the delays often seen in ad hoc domestic arbitration proceedings, it is still recommended that franchisors choose to settle disputes by arbitration outside India over submission to jurisdiction of Indian courts. India will go to the polls in the first half of 2019 to elect a new federal government. However, regardless of which party comes to power, the reform-oriented trajectory adopted by successive governments since 1996 is widely expected to continue. Therefore, despite the limitations on FDI in multi-brand retail, we believe there are significant opportunities available for international companies looking to establish a presence in India through the franchising model. 1 Nipun Gupta is co-head of the India strategy group at Bird & Bird LLP. Divya Sharma is a solicitor (registered in England and Wales) and an advocate (registered in India). 2 See https://www.ibef.org/blogs/india-s-franchise-industry-the-road-so-far-and-way-forward (last visited on 2 January 2019) and also see 'Indian Franchise Industry Outlook for 2018' available at https://india.franchiseasia.com/information/indian-franchise-industry-outlook-for-2018 (last visited on 2 January 2019). 3 'Indian franchise industry outlook for 2018', available at https://india.franchiseasia.com/information/indian-franchise-industry-outlook-for-2018 (last visited on 2 January 2019). 4 For details refer to the FDI Circular published by the Department of Industrial Policy and Promotion (DIPP), Ministry of Commerce and Industry, Government of India. The circular as at 28 August 2017 is available at https://dipp.gov.in/sites/default/files/CFPC_2017_FINAL_RELEASED_28.8.17.pdf (last visited on 19 December 2018). See also Press Note 2 of 2018 available at https://dipp.gov.in/sites/default/files/pn2_2018.pdf (last visited on 2 January 2019). 5 An inventory-based model of e-commerce is defined as a model in which inventory of goods and services is owned by the e-commerce entity and sold to consumers directly. 6 A marketplace model of e-commerce is defined as the provision of an information technology platform by an e-commerce entity on digital and electronic networks to act as a facilitator between buyer and seller. 7 Under the provisions of the FEMA. 8 Indian exchange control laws are comprised of the FEMA and rules, regulations and notifications made under it from time to time. The FEMA is administered by the RBI, India's central bank. 9 The Agreement on Trade-Related Aspects of Intellectual Property Rights is Annex 1C of the Marrakesh Agreement Establishing the World Trade Organization, signed in Marrakesh, Morocco on 15 April 1994. 10 https://ipindiaonline.gov.in/tmrpublicsearch/frmmain.aspx (last visited on 19 December 2018). 12 Calvin Klein Inc. v. International Apparel Syndicate 1996 PTC 293 (Cal). 13 In the case of Christian Louboutin SAS v. Nakul Bajaj & others, the Delhi High Court, held that the online retailer would be liable for trademark infringement if it can be proven that the goods it was selling were counterfeit. The decision is available at https://indiankanoon.org/doc/99622088/ (last visited on 2 January 2019). This decision was also followed in L'Oréal v. Brandworld and another, decided on 12 November 2018 (available at https://indiankanoon.org/doc/55867232/ (last visited on 2 January 2019)), which dealt with sales of spurious cosmetics by an online retailer. http://articles.economictimes.indiatimes.com/2014-10-21/news/55279633_1_l-oreal-online-retailer-trademark (last visited on 19 November 2015). 15 Intellectual Property Rights (Imported Goods) Enforcement Rules 2007, available at www.wipo.int/wipolex/en/text.jsp?file_id=201652 (last visited on 2 January 2019), as amended by the Intellectual Property Rights (Imported Goods) Enforcement Amendment Rules, 2018, available at https://www.manupatrafast.com/ba/Ruledispbot.aspx?nActCompID=13364&iActID=1861www.wipo.int/wipolex/en/text.jsp?file_id=201652 (last visited on 2 January 2019). 16 Justice K Puttaswamy & others v. Union of India and others, available at https://www.sci.gov.in/supremecourt/2012/35071/35071_2012_Judgement_24-Aug-2017.pdf (last visited on 2 January 2019). 17 Finance Act 1994 (as amended), Chapter V, definitions 47 and 48. 18 RBI master direction on foreign investment in India, https://www.rbi.org.in/Scripts/BS_ViewMasDirections.aspx?id=11200 (last visited on 2 January 2019). 19 Section 19 of the Contract Act. 20 Section 18 of the Contract Act. 21 See the exception to Section 19 of the Contract Act. 22 Section 10 of the Specific Relief Act 1963 as amended by the Specific Relief Amendment Act 2018. For contracts that are not specifically enforceable see Section 14 of the Specific Relief Act 1963 as amended by the Specific Relief Amendment Act 2018. 23 Section 20 of the Specific Relief Act 1963 as amended by the Specific Relief Amendment Act 2018. 24 Press Note No. 8 (2009 series), http://pib.nic.in/newsite/erelease.aspx?relid=56146 (last visited on 2 January 2019). 26 Gujarat Bottling Company Limited v. Coca-Cola Company, AIR (1995) Supreme Court 237. 27 See http://mcia.org.in/ (last visited on 2 January 2019). 28 See http://taxguru.in/wp-content/uploads/2016/01/Arbitration.pdf (last visited on 6 January 2016). 29 For text of the Act see http://egazette.nic.in/WriteReadData/2016/167379.pdf (last visited on 6 January 2016). 30 See https://www.thequint.com/news/business/decoding-mcdonalds-vs-bakshi-that-jeopardized-169-outlets (last visited on 4 January 2019), and https://www.bloombergquint.com/business/eighteen-of-43-mcdonalds-outlets-in-delhi-reopened-says-vikram-bakshi#gs.LScixDlM (last visited on 4 January 2019). 31 See https://www.indiamacroadvisors.com/page/category/economic-indicators/international-balance/foreign-investment/ (last visited on 2 January 2019). 32 See http://dipp.nic.in/English/Publications/FDI_Statistics/2016/FDI_FactSheet_April_Sep_2016.pdf (last visited on 19 December 2016), and http://www.doingbusiness.org/en/rankings?region=south-asia (last visited on 2 January 2019).